In "Herbivores In The Kitchen," Sierra explores recipes in vegan cookbooks (and the cookbooks themselves), so you can become more familiar with the content, the process, and the delicious outcome! As a beginner/amateur level cook, Sierra begins with a fairly simple recipe: Cream of Mushroom Soup from Chloe's Vegan Italian Kitchen. Chloe's Vegan Italian Kitchen is a book of 150 vegan Italian recipes created by Chef Chloe Coscarelli. Coscarelli is a classically trained chef and author of Chloe's Kitchen and Chloe's Vegan Desserts. In her Italian kitchen, she transforms traditional Italian cuisine into delicious and flavorful vegan recipes that strike "the perfect balance between comfort and creativity." Some examples of recipes include Butternut Ravioli with Brown Sugar, Pumpkin Risotto, Polenta Berry Cobbler, and Roasted Banana Bourbon Ice Cream. I chose Chloe's Vegan Italian Kitchen first because many of the recipes require few ingredients (15 or less including salt, oil, and pepper). Working with what I have in my pantry or refrigerator is important to me because I don't want anything I buy to go to waste, and it also forces me to be flexible with recipes and get creative. Improvising is most of what makes cooking fun! 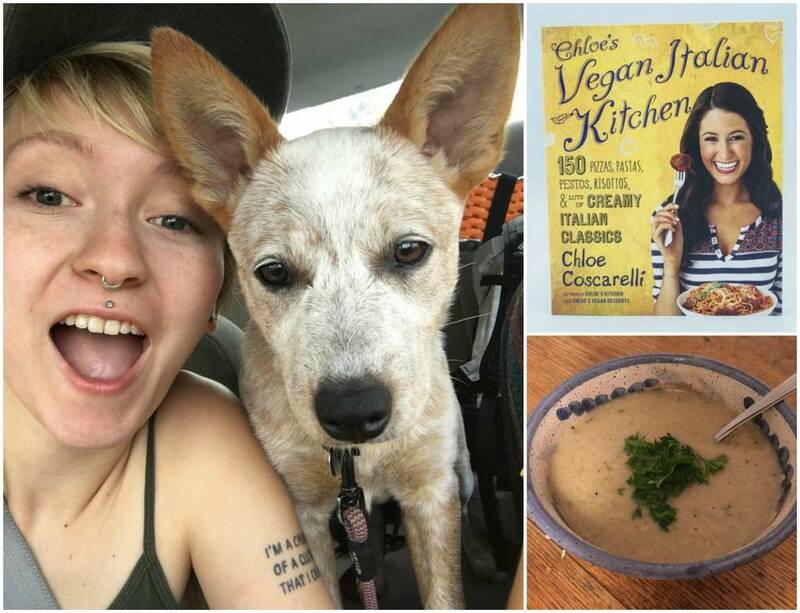 Second, Chloe's adaptations of Italian recipes do not require complex substitutions and generally replicate textures and flavors with whole foods like white beans, mushrooms, lentils, nut milks, etc. While faux cheese and meats are super yummy and I would have a very hard time being vegan without them (#praiseseitan), I prefer to use beans, nuts, and legumes in my cooking if I have the time. The recipe itself was simple and very straightforward, which I like! I was told to sauté, whisk, boil, simmer, and blend my ingredients in that order. The outcome was a creamy mushroom soup that only got more delicious overnight-- my partner and I ate the entire batch in 3 days. As with all of my meals, I doubled up on spices and garlic (because 1 garlic clove is never enough in my humble opinion) which I think was important. Because I used 1 pound of mixed mushrooms instead of white mushrooms, and a low-fat can of coconut milk instead of regular coconut milk, the soup didn’t turn out quite as thick or flavorful as Chloe’s probably was. My solution was to add a hearty serving of nutritional yeast and an herb blend (rosemary, oregano, onion, etc.) and let the soup cook a little longer than directed. Altogether, this was a yummy, comforting soup recipe with few complex ingredients for a very satisfying outcome. If you’re trying to pick up a cookbook for amateur cooks who like comfort food and Italian cuisine, Chloe’s Vegan Italian Kitchen is an excellent pick. Especially consider it if you like to adapt your recipes to fit your lifestyle and don’t mind getting creative! Keep up with "Herbivore Stories" to learn more about our team (the animals behind Herbivore), the issues we are passionate about, our wonderful vendors, our favorite recipes, and much more!